Achieve good health, inner peace and harmony by joining us in one of our yoga classes. We focus on meditation and spiritual development. Our main goals are to improve overall physical and mental health. This is an ALL Levels class with modifications and variations offered for each exercise to personalize and challenge each and every student. Basic Yoga Poses with free weight exercise! Sculpt Flow will challenge and grow your strength and flexibility all to some awesome musical jams. Squats, Lunges, Cardio. Links conscious breath with a mindful and energetic flow of yoga poses. In this class, you will build strength, flexibility, and concentration. It introduces foundational yoga postures. Standing, Balancing, Spine Strengthening, and Hip opening poses are followed by a relaxing Surrender in each class. Seated and supine poses designed to relax muscles and gently lengthen connective tissue. Poses are held for longer periods of time and are supported with props such as bolsters, blocks, blankets, sandbags, and straps. Longer holds facilitate relaxation. This is a quiet class with gentle or no music. Come in your most comfortable clothes and leave relaxed. A gentle form of yoga that is practiced sitting on a chair or using chair for support. Start your morning off right! Incorporate Sun Salutations, foundational poses, balancing poses and fun sequencing. Challenge your focus, balance, strength and flexibility as you link breath to movement in this moderately paced class. A community class designed for those of us overcoming addiction. Whether you are in active recovery or simply seeking a substance - free environment to connect with peers, you are welcome here. A great way to take it slow and easy while still developing core strength, muscle tone, increased flexibility and balance. Postures are presented in a simple to follow flow with time for modifications. This slower paced practice allows a deep connection to your body and breath. Non-heated class. 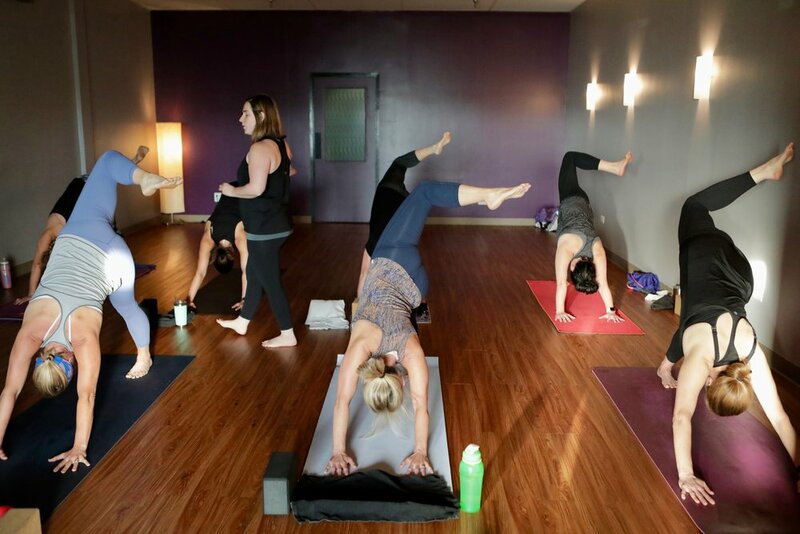 This fun-loving and causal class focuses on the basics of Vinyasa yoga. This class moves at a slower pace and is great for beginners of all ages to try yoga. Students learn yoga basics through teaching and demonstrations. Bring your mom, your son, your friends, your visiting aunts and uncles for a fun family and friends experience!